"The Bit 1" Lock System" allows to interchange a bit instantly. 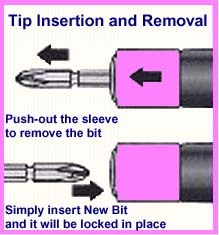 Accepts "Inserted" tip freely without any operation. When "Walking" and "Carrying" the screwdriver you will never loose the bit. WAP21 Phillips (+)#1 & #2 1/4" Hex Shank 1-pc. WAP22 Phillips (+)#2W 1/4" Hex Shank 1-pc.